It did this the other day but after a few turns of the key the dashboard lights came on so I'm suspecting a bad connection somewhere. Anyone wanna point me to any obvious known problem areas for this? I would suspect the ignition switch itself. get ignition lights it would suggest a faulty switch. As Geoff has said, more than likely the ignition switch. Might be worth checking the main connector going into the fusebox from the battery (Battery side), the connector broke on mine and i lost most of the electrics. Put the starter motor wire direct onto the battery and the car turned over and would run. if that turns out to be the problem. Thanks for the replies, I should get a chance to look at it tomorrow/thursday so I'll post when I know more. 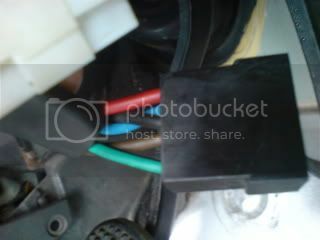 The wires to the black block connector are as follows: red, black, blue/black, brown, green/black as stated by lanciamad. Both brown and black are live. 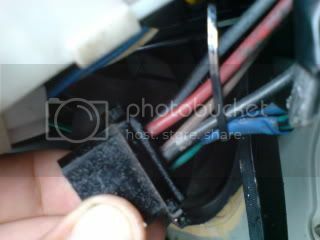 The wires from the connector to the ignition switch are as follows: red, blue/black, brown, black. The first thing that's obvious is five wires have become four... the black wire, which is live, connects to nothing! There is no wire in the block connector on the switch side to connnect to it. The next obvious thing is that the green/black wire has changed to black... I'm sure the Lancia technicians had a reason for doing that but... Anyway, all the wiring looks original. When I put my multimeter, set to continuity, onto the connections on the switch side without it connected to the other side I find that it appears to work as it should: On turning the key the brown wire connects to the black wire (to connect the ignition) and also to the blue/black wire (to give power to the wipers/lights etc). Turning the key to the starter position means the brown wire also connects to the red wire, which would activate the starter. So all appears well with the switch. But connected up all is dead. The 12 volts that I saw when I put the meter onto the brown wire does not appear at the other wires when the block connector is connected up- and the brown wire itself instantly reads no volts, and doesn't connect to the other wires when the key is turned, despite those wires proving ok in the continuity test. If I put a jumper wire from the brown wire to the blue/black ignition wire I get nothing- no ignition lights, whether the connector block is joined or not. Despite the fact that the brown wire reads 12 volts when not connected. Now, back to the live black wire that goes nowhere. If I put a jumper wire from the black to the blue/black ignition wire I get ignition lights. Connect the block together and then I get full operation of everything. Turning the key operates the starter too. What is the black wire for if it is not connected to anything? Bear in mind it appears to carry enough current to power the ignition and all it's extras- starter motor, lights, wipers, heater fan etc etc. I know because I switched them all on at the same time. The battery connections are fine and the alternator is functioning correctly- battery is being charged. Is it safe to run the car using power from the black wire? Where do the black wire and brown wire originate from- can I trace them to their source or are they likely to be pink and yellow at the other end...? As the switch and switch wiring appears to function correctly when continuity tested I'm very confused with this. As soon as the block connector is joined the brown wire's 12 volts becomes zero, and those 12 volts won't power the ignition when connected with a jumper wire without the block connected; so if the problem is a short circuited switch it doesn't explain that. Nor does it explain correct functioning on the continuity test of the switch. Or does it...? If any of you electrically minded folks want to tell me how daft I am because it's totally obvious what is happening then please chip in- I don't mind if I look like a numpty... it's all a learning process! the ignition switch breaking the Ignition power when off. hope that makes sense, if not pm me and we can exchane tel numbers. Brings back memories I think i make sense of what your saying, sounds like your possibly missing a wire and got wires connecting wrongly to each other, it maybe easier if i tell/show what i've got and you might be able to connect things up as i believe they should be, correct me if i'm wrong anyone!!! This is what i've got on my car which i believe is correct although not all original. From the ignition switch to the black connector you should have, Red, Black, Green/Black, Blue/Black and Brown. At the connector block it turns into. To make things a bit easier to see and look after, (as i had many many electrical problems when i got the car), my brown wire is connected to another 'non-original' wire straight to the positive terminal on the battery. Blue/Black wire does lights/wipers as original. Red goes to starter motor as original. And i think the green/black wire connects upto another wire that goes to the relay, (Fuel injected car) for ignition. Geoff, your explanation of how the switch works makes sense to me. The spare switches you have- do they include the short length of wiring and the connector? Five wires? Same colours (bonus!)? Are you sure it'll fit a Beta? If so could I buy one from you? Failing that does anyone else have an actual Beta ignition switch? Do new ones exist? You wouldn't, due to no feed to the ignition. I read through the thread you provided a link to- interesting! Life with Lancias, eh?! Geoff, thanks for braving the spiders; more courage than me...! That switch wiring certainly sounds the same, but black? My switch is chrome. That doesn't matter to me but it might mean it is actually quite different. Or are you referring to the rear of the ignition barrel where the wires go in? I'll have a good look at mine tomorrow and if it looks the same or close to your description then I'll have it- post here or pm if you prefer with your price inc postage. Thanks so much for your help guys- I really appreciate it. I like this forum already and as I'm planning to keep the car and run it as a 2nd daily driver/10k miles a year I'm sure I'll be on here a lot...! Chrome keyway, grey barrel, black switch unit. Ok Geoff, thanks for that. I won't get a chance to check properly now til later in the week so I'll let you know.